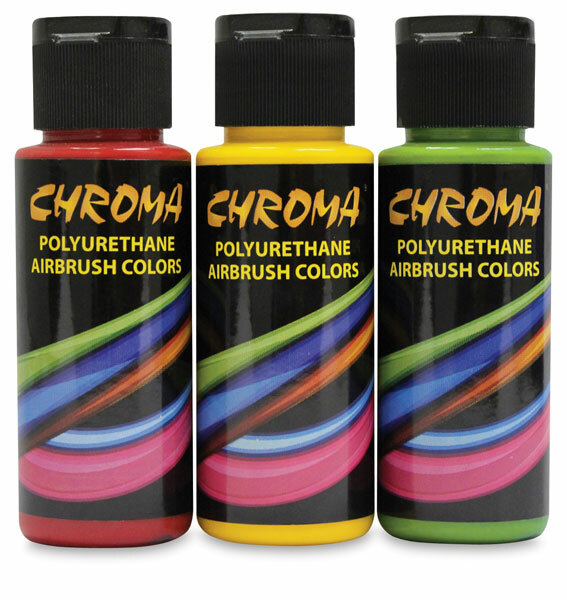 Formulated with input from leading wildlife artists and other fine artists, Chroma Polyurethane Airbrush Colors represent the finest in co-polymer technology, boasting a special polyurethane binder that provides a unique velvet matte finish. 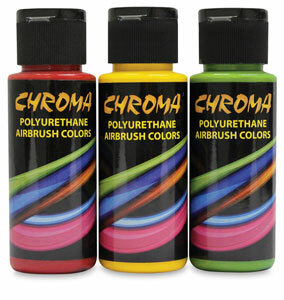 These highly concentrated colors are waterbased, premixed, and ready to use. Perfect for all applications on wood, metal, textiles, paper, illustration board, wood resin, canvas, and much more, the paints dry virtually on contact to form a tough, water-resistant layer of pure color. Set of 6 Wild Fowl Colors — One 2 oz (59 ml) bottle each of Raw Sienna, Sable, Nutmeg, Driftwood, Chestnut, and Taupe. Set of 6 Primary Colors — One 2 oz (59 ml) bottle each of Ultramarine, Canary, Carbon Black, Phthalo Green, Warm White, and Naphthol Crimson.